A thoughtful gift for newlyweds or anyone setting up a first-time kitchen, this two-piece carving set features an 8-inch carving knife and a 6-inch fork. The carving knife provides a razor-sharp blade with a hollow-ground edge to prevent food from sticking to the blade, while the fork's prongs curved slightly, making it easy to lift meat and offering increased maneuverability while slicing. Use the knife and fork for slicing turkey, ham, pork roasts, and more. Both pieces come in a handy storage box with indents that keep the knife and fork secure. 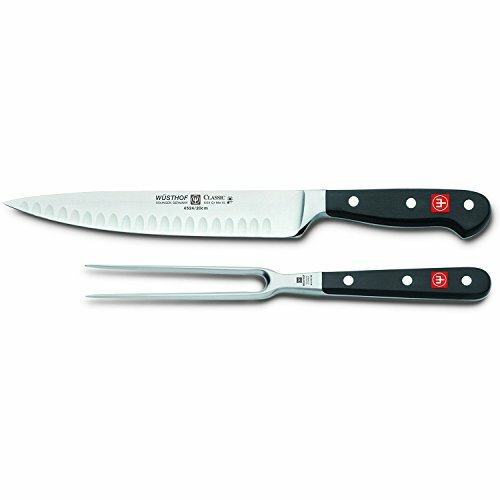 Made in Solingen Germany, "The Cutlery Capital of the World", the Wusthof Classic knife and fork feature a special blend of high-carbon German stainless steel throughout the whole length of the blade and tines for exceptional strength and balance. The knife also provides a sharp, precisely tempered blade for safe, efficient use. Laser tested for accuracy, the unique, compound angle of the blade tapers from the spine of the knife to the edge to create a sturdy, yet extremely sharp cutting surface. The blade also tapers from the bolster to the tip for added strength and flexibility. Another thoughtful detail includes the handles. Both items provide a triple-riveted, ergonomic handle for a secure, comfortable grip. The pieces should be washed by hand with a mild cleanser and dried thoroughly. The two-piece set carries a limited lifetime warranty. From the Manufacturer In the culinary world variety and preparing something outstanding is the key to success. Due to this, Wusthof offers more than 350 different kinds of knives to be able to provide the perfect knife for everyone. No matter which kind of blade and handle shape you are thinking of--Wusthof has the right knife for all your needs.